Virtually all line array applications benefit from and many require the use of software modeling to aim each array. VUE supports AFMS’s EASE Focus software platform for all our line array products. We recommend that all VUE al-Class customers download the latest version of Focus along with our latest Focus GLL files (acoustical and physical datasets). 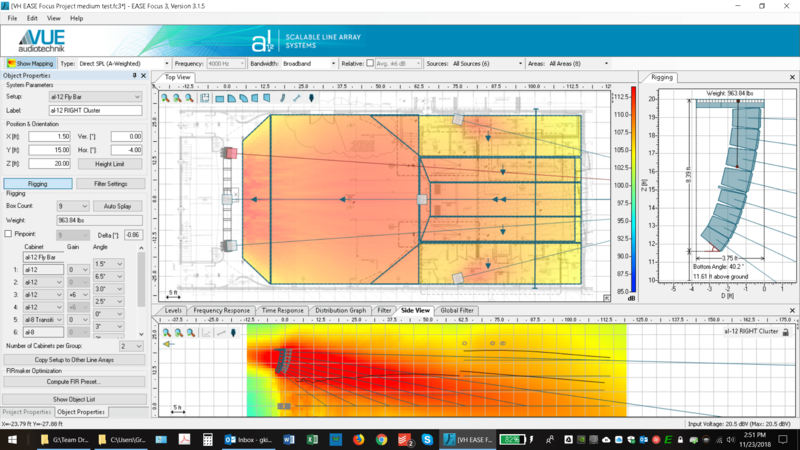 EASE Focus 3 – is an acoustic simulation program for 3D System modeling (displayed in 2.5D) of line arrays, sub arrays, digitally steered columns and conventional loudspeakers. EASE Focus 3 is free software for the end user but required manufacturers to publish their data in AFMG’s GLL format with an embedded licensee code to work with Focus 3. Focus is based on AFMG’s industry standard EASE simulation software. Since the 1990´s, EASE has been the worldwide standard for acoustic simulation both inside rooms and in open areas. Rooms can be defined using a CAD module, absorption coefficients can be assigned to surfaces, and sound sources, as well as listener positions, can easily be added to the model. These data can then be used to generate an exact simulation of reverberation times, speech intelligibility and other acoustical parameters even before the room itself is built.